The ULA TD says she wouldn’t have been surprised to have seen ministers dressed up in leprechaun hats. 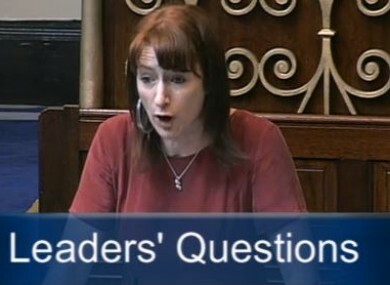 TD CLARE DALY has launched a blistering attack on the Government and the Irish media for what she called the ‘glowing’ coverage of the Obama family’s visit to Ireland this week, in a speech described by the Taoiseach as ‘disgraceful’. Speaking in the Dáil this morning, the United Left Alliance deputy accused Enda Kenny of being overly deferential in his treatment of the US President, and said the press had shied away from any proper questioning of comments made by First Lady Michelle Obama. She said there had been “special news bulletins” covering what Michelle and her daughters had for lunch during their visit to Dalkey, but “very little questioning of the fact that she had lunch with Mr Tax Exile (Bono)”. Deputy Daly also criticised the First Lady’s comment at the Gaeity Theatre that she was glad to be ‘home’, saying Michelle had spent ‘less than a week in the country’. She also accused the Obamas of exploiting the President’s Irish ancestry, in spite of his ‘tenuous links’ here. Regarding Barack Obama’s speech on the Northern Ireland peace process, Daly said his promise of continued US backing of the effort was the ‘biggest irony of all’. She said that ‘any serious examination’ of the facts showed the President was a ’war crimimal’, and lambasted America’s decision to arm rebel groups in Syria. You, Taoiseach, turned a blind eye to all this… You showcased us as a nation of pimps – prostituting ourselves in return for a pat on the head. Daly told the Taoiseach that she and other members of the ULA had been speculating as to “whether you were going to deck the Cabinet out in Leprechaun hats and stars and stripes”. The Northern Ireland peace process is very fragile. Far be it from you to criticise someone who wants to support that process. He said the Government did not support the lifting of the arms embargo in Syria, and was fully behind plans for an international peace conference on the issue to be held in Geneva. Email “We were showcased as a 'nation of pimps' during Obama visit - Daly”. Feedback on “We were showcased as a 'nation of pimps' during Obama visit - Daly”.